Objective statement: Description of the type of position you are looking for. You could also write a sentence outlining your future career or educational goals. Skills: Provide information on some of your key skills and abilities. In 3-5 different categories list skills related to the position you are applying for. Employment history: List all previous nursing employment, and a summary of what your duties were in each job. If you are new to the field list jobs that have transferable skills that are relevant to the job you are applying for. 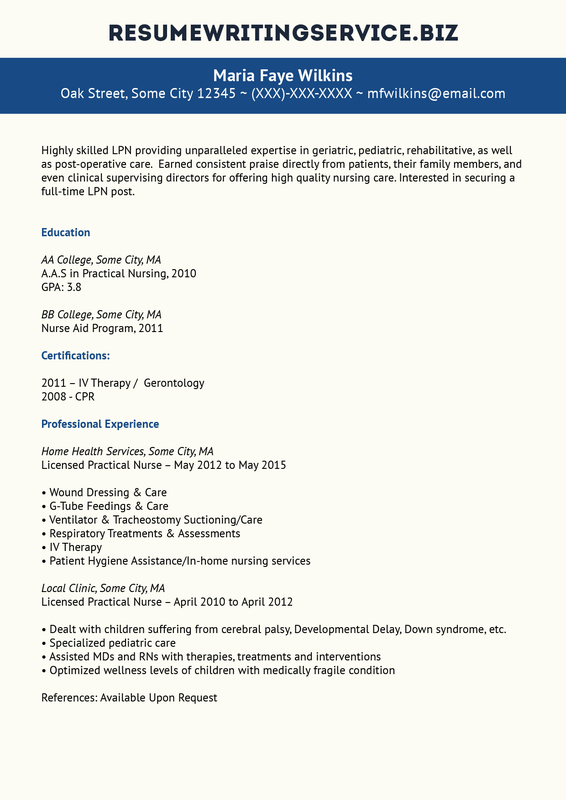 Use an LPN resume sample as an LPN resume template as a guide for writing your resume. You can use the job criteria of the position you are applying for in conjunction with the sample LPN resume. Work your way through the resume section by section. In the objective statement and skills section make sure to include keywords and skills from the job criteria of the position. Is the format well laid out with a good balance of white space and text? Does the resume fit well on the page without appearing either overcrowded or not full? Does the resume use bullets and avoid paragraphs and long sentences? Is your most important information highlightedusing bold, italics or underlining? Does the included information support your overall goal or objective statement? Your resume is going to be the first impression employers have of you in most cases. You want it to look professional and be easy for employers to see those skills you have that qualify you for the position. It is very important for writing a CV Netherlands. According to the Bureau of Labor Statistics, the median salary for a practical nurse is $41540 annually or $19.97per hour. LPN/LVN employment is expected to grow 25 percent through 2022 which is much faster than the average of other occupations. There are currently around 700,000 LPNs working in the U.S., not all of them had amazing resume for lvn, so boost your chances. To get inspired you can also have a look at our staff nurse resume! For proper assistance with your LPN resume, get in touch with our experts now!